The Minister of State for Home Affairs, Shri Kiren Rijiju addressing the India Disaster Response Summit, in New Delhi on November 09, 2017. New Delhi : The Union Minister of State for Home Affairs, Shri Kiren Rijiju has said that India need to prepare itself for moving towards Disaster Risk Management (DRM) and Disaster Risk Reduction (DRR) from an approach of traditional Disaster Management. He emphasised that Disaster Mitigation Strategy should be areas of priority for addressing Disaster Risk Management. 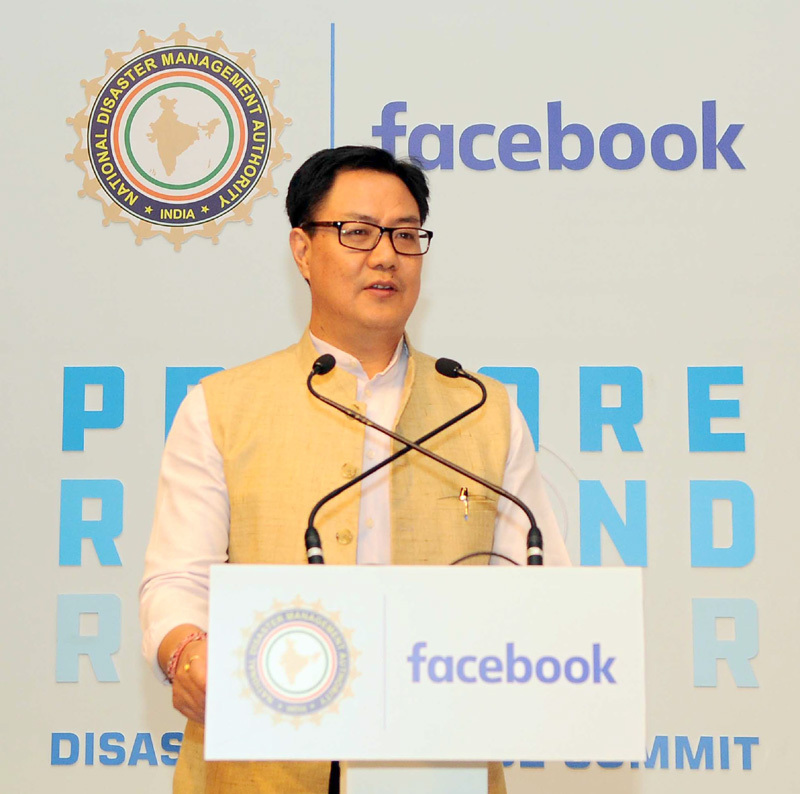 Shri Rijiju was inaugurating the ‘India Disaster Response Summit’, organised jointly by the National Disaster Management Authority (NDMA) and Facebook, here today on how best to leverage social media platforms to ‘prepare, respond and recover’ for, during and after a disaster. Calling it a great example of execution on the Prime Minister Shri Narendra Modi’s ten-point agenda on Disaster Management, which has clearly listed harnessing technological innovations to create a culture of disaster resilience in the country, Shri Rijiju said, the world is moving towards partnerships, where people are proactively partnering with the Government in responding to disasters. This partnership is a benchmark and first of its kind – we are the first Government to partner with Facebook on disaster response, he added. Shri Rijiju also invited other technology companies to create tailored solutions for disaster-related challenges. Shri Rijiju said that reaching out to the people and communities is the primary responsibility of all stakeholders and efforts should be to make people aware, informed and to guide them during emergency situations. He urged community groups and stakeholders to find innovative ways to inform people on time in scenarios of Disaster Management. He said the efficacy of Disaster Management requires a well defined guideline and the role of media is vital when disaster strikes and even in executing rescue and relief operations. He exhorted the communities to come forward with new techniques of sharing information on real time basis for better handling of situation at disaster scenario. Technology can be leveraged in providing a quick response and information to people at time of need, he added. Shri Rijiju said collaboration with various stakeholders including NGO’s and private players could provide the necessary base for response with a vision towards ‘Capacity Building’ to handle disaster risk situation for addressing emergency rescue situations. He said that Government will act as facilitator towards information and communication among various stakeholders by helping evolve new modes of communication for better contact between the ‘Government and the People’. Shri Rijiju said that social media affects everybody’s life and common sources of communication through social media has played a vital role in day-to-day information communication, which needs to be leveraged in proper direction. Mentioning about earthquake resistant technologies adopted by foreign countries, he said that efforts should be in the direction of better planning towards evolving technology in line with better communication tools for disaster response planning. Speaking on the occasion, Shri R. K. Jain, Member, NDMA, said, the NDMA is proactively using social media for awareness generation. This collaboration is a milestone towards integrating social media with disaster response activities. He hoped this partnership will open new avenues for using mobile technology in disaster situations. Later participating during a panel discussion on the need for effective data analysis and tools, Shri Kamal Kishore, Member, NDMA, said, social media can help shape a future where, on the one hand, vulnerable communities become increasingly self-reliant and on the other hand, Government agencies have more powerful tools to get real-time feedback and reach out to people whom they seek to serve. Introducing the Disaster Information Volunteers (DIV) programme, wherein a network of trained volunteers would provide supplementary information on disasters in their local communities to assist Government relief efforts through the Facebook Workplace platform, Facebook Head (Policy Programmes) for South Asia, Shri Ritesh Mehta said we are aiming to empower communities by building products that connect people and create positive social impact. The programme will be piloted in two disaster prone states – Assam and Uttarakhand, he added. Facebook will now share its disaster maps, developed using aggregated, de-identified data, with NDMA. These maps can aid swift disaster response by providing real-time, actionable information. Senior officials of MHA, NDMA, National Disaster Response Force (NDRF), National Institute of Disaster Management (NIDM), Central Government Departments, representatives of Facebook and Non Governmental Organisations (NGOs) attended the event.